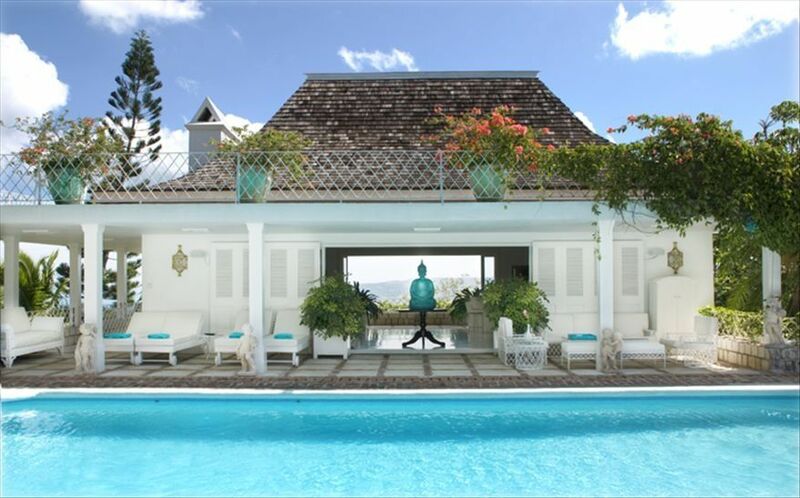 Hammerstein Highland House is a amazing estate on 17 acres on the hillside in Montego Bay, Jamaica. Oscar Hammerstein wrote 'The Sound of Music' from the terrace, overlooking the beautiful hillside. We have had quite a few celebrity guests such as Meryl Streep and Tracy Ullman. This villas is filled with history. The home is very private and located about 5 minutes from the beach and 20 minutes from the airport. The home is fully staffed with a chef, butler, housekeeper, gardener and laundress. A van and driver can be arranged for any size group. Private spa treatments are available on site. The home also has a tranquil pavilion ideal for yoga retreats and the like. Come enjoy the real Jamaica! A van and driver can be arranged for any size group. We have a two acre organic garden. The produce is used for our meal plan. Our chef can prepare food to suit your needs, including vegan. Onsite we have a yoga pavillion that is screened on with wooden floors and ceiling fans. Our home is perfect for retreats. The owner, Brenda Isaac has an amazing foundation called One Love Learning Foundation . She was founded OLLF after she bought Highland House and became involved in the local community and saw the needs of the children at local schools. Now Highland House serves as an important base for OLLF's Learning Center. Truly a family project, Keressa Page, Brenda's daughter manages the villa. This home was purchased when the owner fell in love with the property and it's history. We live in Atlanta and can visit easily with a quick 2 hour flight. It is spacious enough for our large family and to rent to groups. The property took our breath away and we instantly fell in love. When you stay at Highland House you are completely secluded on 17 acres, but have easy access to Montego Bay (just 20 min drive)and full use of our Beach membership at Seawinds Beach Resort(just 5 min drive). Our home has an organic garden with loads of fresh produce used for meals. Fully staffed with Chef, Butler, Laundress, Housekeeper, Gardner and Nightwatchmen. The villa is perfect for combined families or groups of friends. We have large, open common areas for entertaining. We also offer private terraces off of each bedroom for private space. The villa has a fabulous yoga pavilion on the grounds, screened in and with ceiling fans. We can offer a special detox menu for wellness retreats. Beautifully appointed accommodations. Lush flora surrounds the estate. Tremendous service from the staff. Amazing organic garden fresh to table cuisine. Options allow relaxing on the estate with private balconies, pool, and back porch panoramic views from the mountain side retreat. Additionally enjoyed the short trip to Negril, Ocho Rios and tourist sites in the Montego Bay area. I have visited the Hammerstein Highland House several times. It is a remarkable property with amazing accommodations, food, organic gardens and views. The staff could not be more wonderful and you will not find a more beautiful vista from a porch anywhere. I always felt well taken care of and safe on this lush property up in the hills. I will be back again (and again). Another wonderful experience, it's been a while since my last visit to Highland House - as always it's like being in paradise. Sitting on the terrace with the views of Montego Bay, places for gather with all your friends but also little hideaways to go read a book. The staff is amazing, Sheriann preparing fresh meals straight from the garden. Looking forward to visiting again. I spent a long weekend with 6 of my college girlfriends at Hammerstein Highland House to celebrate our 50th birthdays. It far exceeded my expectations. The accommodations, staff, food were exceptional. We also had on-site massages and yoga classes. In addition we went on an excursions to Blue Hole waterfalls and to shop and eat at a local restaurant. Our driver/guide Olando took great care of us and I felt like we experienced a small slice of Jamaican life. Every need was meet by the staff. When one of my friends mentioned chocolate chip cookies- a plate of homemade cookies magically appeared. So many small details were not overlooked. We also loved the views and relaxing my the pool. It was a perfect weekend and I would love to return again one day. Praying that Hurricane Matthew does not do much damage! I am so glad you had such a memorable trip at our villa. We would love to have you again! I will share your review with our staff. They love to hear the positive feedback. We are truly blessed with a wonderful team. Luckily we had to no damage from Hurricane Matthew. 4 adults and 7 girls, ranging from 7 to 15, spent an amazing week at this amazing home in Montego Bay. It is such a historic home with amazing views perched atop a hillside. The accommodations were very nice, the pool was perfect, and the scenery was spectacular. I'd rate the property itself a 10 out of 10. However, the property pales in comparison to the staff that takes care of you while you are there! Carl should actually play a butler in a movie as he is in charge and makes sure you are relaxing. Sherianne's meals were delicious and enjoyed by everyone! Kimoya kept the rooms tidy and neat, and the towels well stocked by the pool. JJ and T Man looked after the grounds - and us - 24/7. We all had an incredible experience here, and felt like we left with some great friends as well! Don't miss this slice of heaven in Jamaica! If you like old fashioned tropical glamour with a view almost as good as that of the opening sequence of the Sound of Music then Hammerstein Highland House is for you. Built in the 1950s by Oscar Hammerstein, the lyric and book writing partner of Richard Rodgers, and maintained by current American owners, it has the timeless classy vibe of a place trying just hard enough. The décor is largely white with splashes of bold pastels that bring Jonathan Adler and Kelly Wearstler to mind - without the pretense. The staff is sublime, quiet and efficient and the fresh locally sourced meals by the chef - with ingredients from the property's organic garden are full of traditional Jamaican zest. The pool is fresh as a lake, each room generous and unique. The villa is a ten minute drive up a hill from the bustle of overwrought Montego Bay with its built up beaches and traffic. What a difference a mountain road makes. Yet it's all happily less than a half hour from the airport and the intensely posh Round Hill -- for dinner among the excessive and elite. Unique, divine! Lower rates will be given for 4 or 5 bedrooms instead of 6. The 6th bedroom was originally designed as a child's room and is a smaller than the other guest rooms. However, the two twin beds can be converted to a King Bed with a mattress topper (all of our rooms with twin beds can be converted). The staff gratuity is 15% of the rental fee for the five person staff to divide.